alt: A happy, simple homepage with a check mark under it smiles and whistles next to a dazed, overcomplicated homepage with an X under it. It’s a fact: more and more people are seeking health information online. This means that websites need to be — and look — easy to use. And nowhere on your site is this more important than the homepage. You can’t judge a book by its cover, but you can judge a website by its homepage. The homepage is often your audience’s introduction to both your brand and your content. So it needs to make a good first impression, and fast. Research shows that users decide within just 10 seconds of landing on a webpage whether to stay there or go elsewhere. Keep it clean. Brief text and a simple color palette help you create a clutter-free page. In other words, white space is your friend. Make your purpose clear. Use text and graphics to clearly state the purpose of your website right there on the homepage. Provide a simple navigation. This will enable users to quickly scan and understand the different sections of your website. Implement responsive design. Chances are users will access your website from all kinds of devices. Make sure people can easily view it on a computer, phone, tablet, plane, train, or automobile. But don’t just take our word for it. Test your homepage with your audience and see what they think. 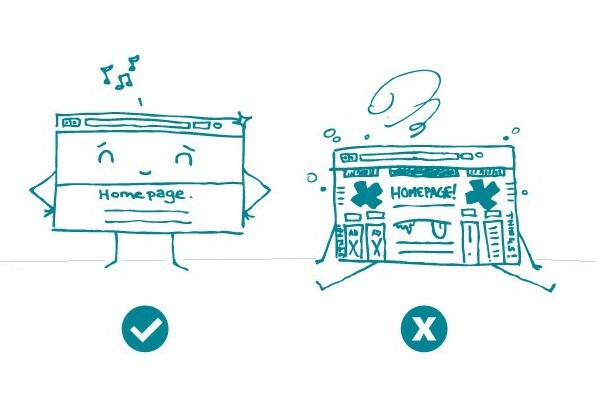 The bottom line: When designing your website’s homepage, keep it simple. This will set the tone for your brand and content.